Spanish may not be the language of love, but investing the time to pick it up is certainly a labor of love. It is a commitment to learning both the language and the culture where it’s spoken, and while it’s not always easy, it’s nevertheless one of the most rewarding experiences I know. In my opinion, there’s no better place to picking up a new language than in the place where it’s spoken. Immersing yourself in a language and a culture can make all the difference in achieving true fluency. If you’re open to the idea of traveling abroad to learn Spanish in Spain, then there are some things you need to consider while choosing a language school. Where you choose to study Spanish is a matter of personal preference. You will learn Spanish no matter which region you choose to visit, despite conflicting regional languages and accents. Spanish accents vary wildly throughout the country. If you don’t speak Spanish yet, this might not be something you would necessarily note on arrival. However, it does mean that you will likely pick up the accent of the place where you choose to study. While most language schools tend to teach a clean version of the language, without regional accents and influences, you will nevertheless become accustomed to the accent and manner of speaking after a duration of time, especially if you choose a home stay as your accommodation. This may not be high on your list of considerations when choosing a location, but it’s a good idea to know what to expect before you go. It is also important to consider that there are several other languages spoken throughout the country. These may not be a matter of consideration to you, but regional languages and dialects will influence how much Spanish you actually hear in the streets and in your everyday life in your city of choice. For example, Catalan is spoken in the region of Catalonia, including the Balearic Islands Ibiza, Mallorca and Menorca, and by almost half of the inhabitants in its capital, Barcelona. Valenciana, a language very similar to Catalan is spoken in and around Valencia, while in Galicia, locals speak Gallego. In the northern part of the country known the Basque region, which includes Bilbao and its environs, the locals speak Basque, a language very different from Spanish, with no known common European roots. If you head south to Andalucía, they may not speak a different language, but locals speak Spanish but with a strong regional accent that is difficult for even natives to understand. These way these southerners drop the ‘s’ in many words it sometimes sounds as if they could be speaking a different language altogether. Choosing a language school shouldn’t be difficult, considering the sheer number of schools concentrated in the cities throughout the country. However, the wide range of choices can be overwhelming to those who have never traveled to Spain. The guide below should give you a good idea of the best places to study Spanish in a country with such a wealth of landscapes and cultural experiences to choose from. 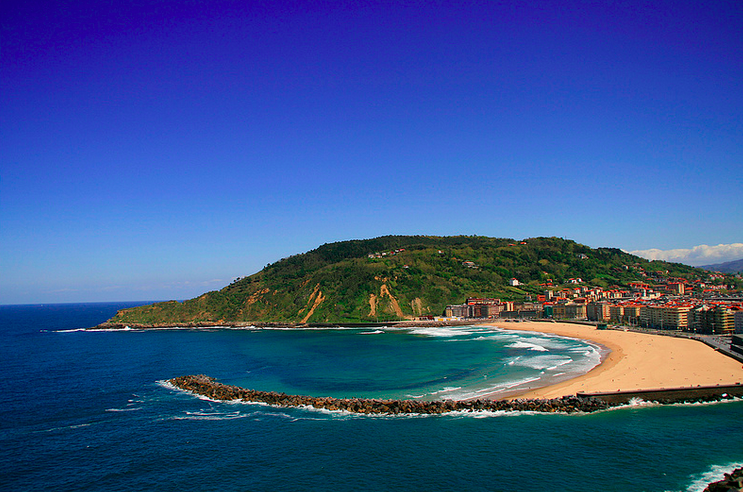 San Sebastian is a great place to consider taking a Spanish course, especially if you love to eat. Nestled into the top of Spain, along the Bay of Biscay, this beautiful city combines European romance with the laid back vibe of the surfing culture for which it is known. If you travel there during the summer or early fall, you’re assured to spend your mornings in the classroom and your afternoons on the beach soaking up the sun. Nights you will likely find yourself crowded into one of the many exquisite pinchos bars racking up empty sticks and tossing your napkins on the floor–a sign of respect for the food. Be sure to try the modern take on pinchos at Zeruko and any of the small plates at Borda Berri, just two of the best places in the city to eat. Salamanca is probably the closest Spain will ever get to a college town, well known for the beauty of its local university–the oldest in Spain–and the vibrancy of its youth. It has the all the charms of a small city but with the grandeur of an intellectual capital and lies close enough to Madrid for an easy visit. Nestled into the highlands, Salamanca is a great place to eat. The dry cool air of the region provides Salamanca with some excellent cheeses, such as hinojosa de duero, an aged sheep’s milk cheese. 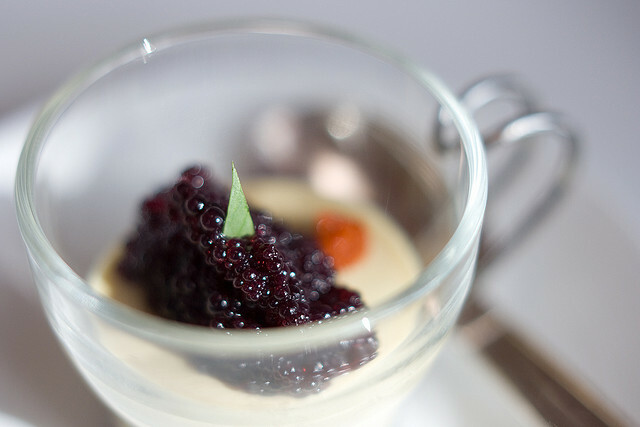 The area, however, is rich in game as well, and it’s not uncommon to find pheasant or partridge on restaurant menus. Of course, like the rest of Spain, pork is highly prized, and you would do well to try the roasted suckling pig (cochinillo al fuego), or sausages like chorizo or salchichón. Visit the local wine regions of Ribera del Duero and the Sierra de Salamanca also while you’re there. The Don Quijote Language School, a renowned language program with campuses throughout Spain, is an excellent option for those who want to study here. Housed in a restored 16th-century monastery, students have history at their fingertips while they take a course from one of the many on offer. Moreover, the school helps to arrange accommodations ranging from host families to private apartments. They offer cooking classes and for those studying at intermediate levels, it is also possible to take courses in Spanish art or history with local professors. You’ll come home armed with a new language and possibly even a new recipe or two. If you’re looking for gorgeous Mediterranean waters and the tranquility of island life, Palma de Mallorca is an excellent place to consider taking Spanish classes. From its white rock calas and pristine beaches to its stunning aqua blue water, Mallorca is nothing short of paradise. If the views don’t seduce you, the food certainly will. Start your days with ensaimada, the iconic Mallorcan spiral-shaped bread coated in powdered sugar. Try the vegetable-rich tumbet, which is similar to a tomato-based samfaina, any of the outstanding local cheeses, or a pork loin with cabbage in cooler weather. Sevilla is the capital of Andalucia and home to the classics of Spanish culture, from tapas to bullfighting to flamenco. Babylon Idiomas is a language school that provides its students with a direct cultural link to the city and its environs. They not only offer a wide array of courses depending on your level and desired level of immersion, but you can also add flamenco lessons to your schedule if you so desire. Each day there is a culture class focused on Spanish history, architecture or film, and many social activities from wine tastings to salsa lessons. For those looking to travel while they study, there are also weekend getaways offered. For an extra fee, students can spend the weekend in Granada, Morocco or sailing on the Mediterranean. If nothing else, you’ll eat well while you’re in the south. 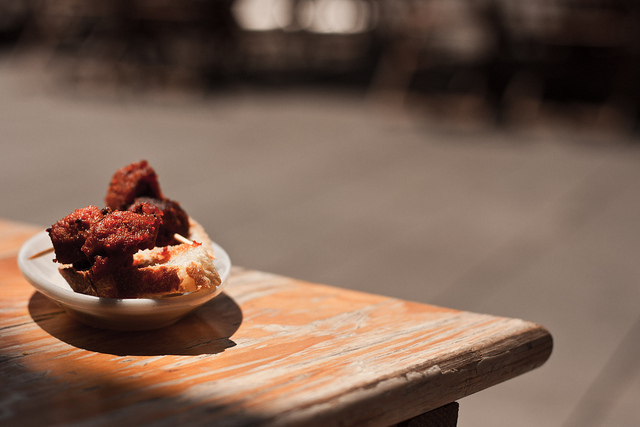 From the famous gazpacho to the fried fish fresh from the sea, Andalucia is a food lover’s dream. Of course, you have to try the huevos a la Flamenca, a fried egg in a tomato and chorizo sauce, or perhaps a rabo de toro (stewed bull’s tail) while you’re there. Wash it down with a local sherry (jerez) or one of the distinctive red wines of the region. If you are looking for sun, sea, and sand blended with all the excitement of a vibrant cultural capital, Barcelona is a great city to consider spending your time in. Although the local language is Catalan, Spanish is spoken everywhere, and is the lingua franca shared among the international crowd that calls the city home. Despite its long list of language schools, Lingua Barcelonais a good choice for its central location in a beautiful old building just a few minutes walk from the city’s central plaza. The school arranges accommodation with host families or in luxury apartments throughout the city. They also offer a wide range of activities to help you integrate into the local life, from day trips to local villages and picnics in the park to tapas tours and hikes in the mountains surrounding the city. There’s no shortage of good eats around this seaside city. From the new food trucks found at events like Eat Street, to Thai and Mexican food, to hole-in-the-wall Middle Eastern restaurants in the Raval neighborhood, you almost never have to eat native in the city, but it’s highly recommendable you do. Add the names of Catalan dishes like pa amb tomàquet–the divine bread soaked in olive oil and fresh tomato pulp–to your lexicon. It will be a second language you’ll be very glad you learned. The area around Tarragona just south of the city will be worth a jaunt for the many vineyards and cava houses found in the D.O. Penedès. As the country’s capital city, Madrid leaves little to be desired. From shopping to nightlife, the capital city has it covered. Choosing to study here certainly has its advantages but especially at LAE Madrid, a language school that not only offers language lessons but also offers a unique learning opportunity through its internship program, open to students from 17-25 years of age. When you’re not studying, it can be assured that you will be eating, because it’s one thing Madrileños know how to do very well. If you’re looking to see a different side of Spain, head to Galicia where the unique climate brings a greener side to the country. In Santiago de Compostela, a good choice of language schools would be Academia Iria Flavia, a small school with a family-like atmosphere that offers classes with a maximum of eight students per class. Students can find accommodation in shared or private apartments, in the school’s residence, or with a local family. With an emphasis on engagement, the schools offers a long list of cultural activities, as well as many excursions to other nearby cities in the region. Between the impressive coastline–the only one along the Atlantic Ocean–and the excellent regional gastronomy, visitors are sure to be charmed by this lovely region of Spain. 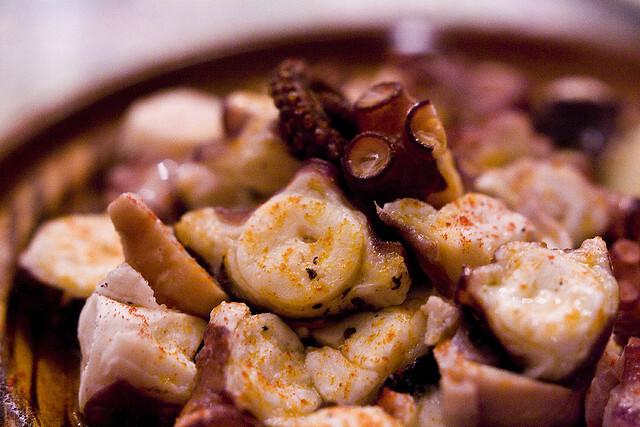 Galicia is probably best known for several of its signature dishes, from its pulpo gallego, soft slices of octopus drizzled in rich olive oil and sprinkled with sweet pimentón pepper, to the delicious dense almond cake known as torta de santiago, named after St. James, the patron saint of Spain. You will be charmed by the abundant seafood and the famous fruity Albariño white wine which is often served with it. If you’re looking for a short break language experience, Tenerife has exactly the experience you’re looking for. At Lailola Language school, you can choose from a week-long safari course, a three-day course or a one-day course. The intensive courses are immersion based, introducing students to life and culture in the Canaries through hands-on, practical experiences with a focus on fun. It includes sightseeing trips around the island, and the price includes breakfasts and meals. A trip to the Canaries is never complete without a plate of papas arrugadas in mojo sauce. These wrinkled potatoes will steal your heart because of the piquant salsa they’re served with, made of an irresistible blend of olive oil, vinegar, garlic, salt and spices. The green version of the sauce, made of cilantro, is also found atop fish and the red paprika-based version atop meat. Aside from these little winners, there are a host of other dishes to try while you’re there, including pollo al salmorejo, chicken marinated in garlic, black pepper, cumin, salt, oregano, vinegar, olive oil, white wine, paprika and thyme. You also shouldn’t leave without trying the very local smoky goat’s cheese from Arico. This volcanic region also produces some very interesting wines that are worth learning about. With 106 vineyards on the island, there will be no shortage of wines to try. There is a saying I’ve heard about learning new languages that goes, “One language sets you in a corridor for life. Two languages open every door along the way.” Having lived in Spain for six years, and having learned not one but two new languages along the way, I couldn’t agree with that statement more. For me, knowing a language has earned me new experiences, new friendships, a deeper and richer understanding of the place where I live, and opportunities to know the places where I travel–be it Mexico, Peru or Costa Rica–a little bit better. It is one of the single best decisions I’ve made in my life, and I hope you try it too. You never know the places it will take you!